When France proposed the challenge at the start of the year, I didn't think it would work for me. Being an impatient finisher completer I like to get stuck into my projects and revel in them until they are complete. But having said that, it is actually working very well and gives me the chance to play along side concentrating on other priority projects, like my nieces wedding stationery! The only draw back is that I seem to have several 'play projects' on the go at once these days! Never mind, it is giving me infinite pleasure. I walk through my craft room to get to my utility room and in doing so, I walk past my play projects sitting on the desk and that in turn gets me pondering on the next step in their creative process. Mind you , I have to admit that I do sometimes get distracted and find that loading or unloading the washing machine has been delayed by the odd 30 mins or so.... Oops. But, like most things, this challenge thing is a work in progress. Sooooo todays tag is one of those play projects that has been ongoing for a few days. 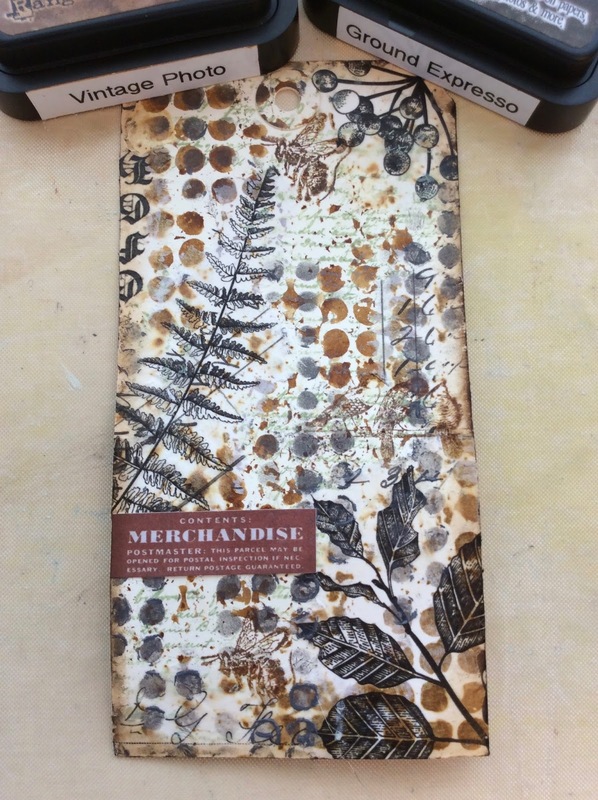 I've called it Botanical Merchandise and here it is. I started off with a Ranger size 8 Mixed Media tag (heavy stock). 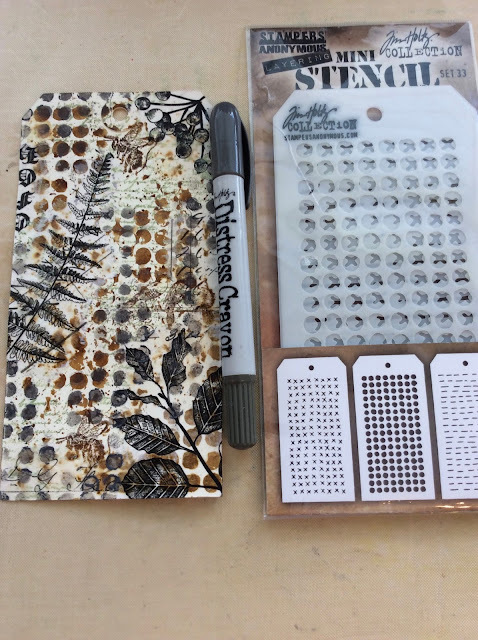 and using Ranger Distress Stain (vintage photo) and Stampers Anonymous Mini Layering Stencil (set 33 - circles) I created random circles, using both the negative and positive of the stencil. 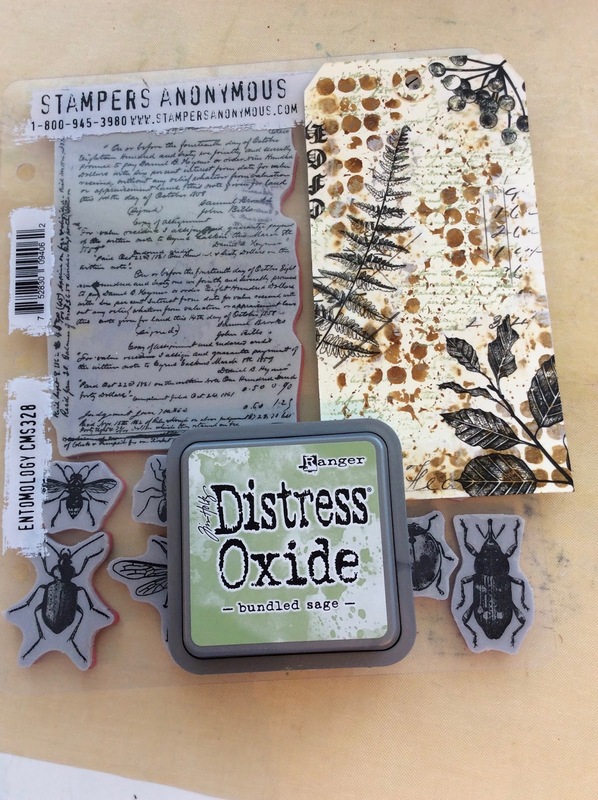 Then I cut various pieces from the Tim Holtz Collage Paper (botanicals) and glued them to my tag using Ranger Multi Medium (matt). Using Ranger Distress Oxide Ink (bundled sage) and the text stamp from the Stampers Anonymous Entomology stamp set (CMS328), I set too randomly stamping script across the tag. 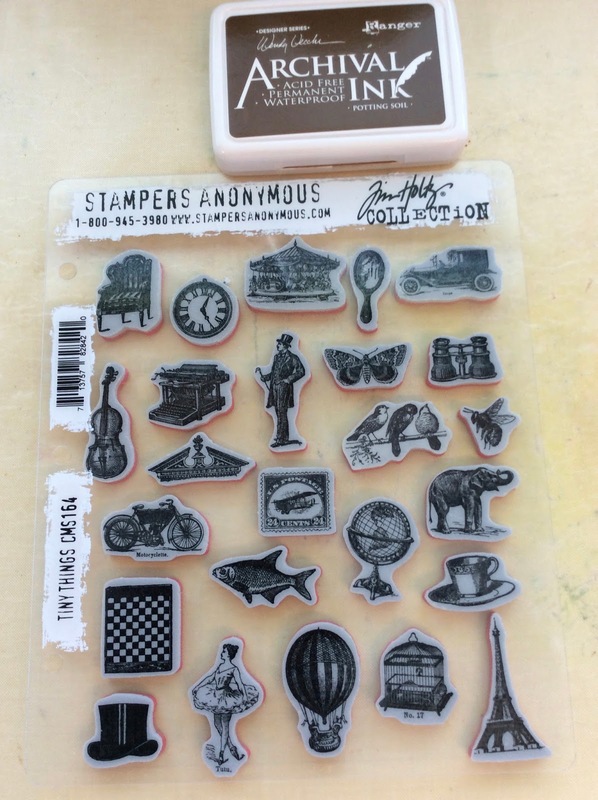 Picking out the bird and the bee stamps from the Stampers Anonymous Tiny Things stamp set (CMS164) I stamped these in Archival Ink (potting soil). To fill in some of the blank spaces and to accentuate the circles already on the tag, I went back to the circles mini layering stencil and blended a Ranger Distress Crayon (hickory smoke) through the stencil using my finger. To frame the tag I used a mix of Distress Ink (vintage photo, ground expresso) around the edges. I also added an ephemera label to one side and sewed all round the edges with my sewing machine. Then I went a bit mad with 'hardware'. Firstly I grunge up a Ranger Numeral (the number 2) with a Sharpie (brown, black), Ranger Distress Crackle Paint (rock candy) and Ranger Multi Medium (matt) which I secured with brads over a strip of Ranger Film Strip Ribbon, also secured with brads but this time the Prima Mechanicals (mini hardware). I put another two of these brads into each bottom corner and a smaller sniper of the film strip above the ephemera label. I chose a wee small bird image for the centre of my circular Ranger File Tab, ageing it with Distress Ink (vintage photo) before adhering the resin self adhesive cover in place. A small silver charm from my stash was similarly coloured and adhered on top with Glossy Accents. The letter N was my choice for my Ranger Type Charm which I glued to a garment tag and looped through a jump-ring along with a little silver leaf charm from my stash and my usual date tag. I attached the jump-ring through my ribbon at the top of the tag. I took the easy option and chose complimentary ribbon from my stash.... et voila. 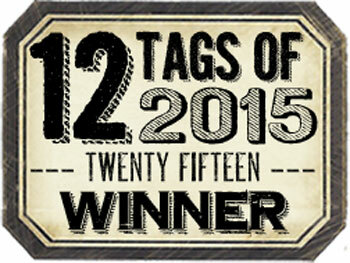 This tag will sit out in my craft room until the end of the month along with my other makes for the month. The jury is still out on the numeral though. I'm comfortable that it ties in with the overall theme of the tag BUT it feels a wee bit too grungy for me... it looks like something I've rescued from the fire! Thanks so much for taking time to read my post. I really do appreciate it and if you'd like to leave a comment (positive criticism is always welcome) I'd be pleased to hear from you.